Well, its that time of the year again and for our readers in the right parts of the country - a compact vacation on a tank of gas. Sure, the fall festivals and quaint white church steeples make Vermont Fall Foliage a world-class destination, but, with the right timing (check out our friends at Foliage Network) and a warm sweater - you are ready to hit the parks and forests of the United States and watch the transition from Green to Yellow to Orange. (And we are not talking about the Terror Alert Status!). Massachusetts Fall Foliage is a no brainer - early in the season - head north to New Hampshire, later follow the coast south - from Maine to Connecticut. Nearest to Boston - try Lexington, Concord and Walden Pond. To really see the fall colors in style, consider one of the many Fall Foliage cruises leaving from New England ports - Rhode Island up to Maine. Each borough - Manhattan, The Bronx, Queens (Alley Pond Park - Leaves and Tashlich), Brooklyn and even Staten Island has good and accessible leaf peeping - just hop on the subway (or ferry). Feeling a bit more adventurous, but still no car? You can get a hour-long moving show of Hudson Valley Foliage from the train (Metro North). Make sure to get a seat on the left side of the train going north or the right going south. 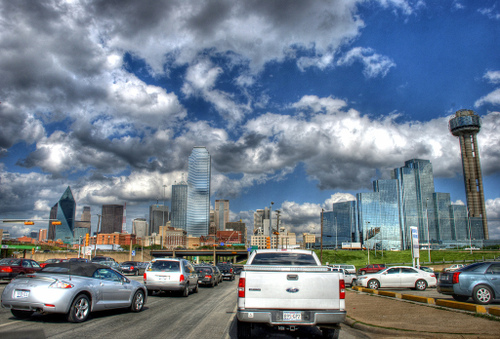 Skip rush hour for better fares and less cellphone chatter. If you have a couple of days to dedicate to New York State fall foliage (and wine tours and more) head north early in the season, while Central Park is still green and check out the Adirondack fall foliage in September. Global warming or not, the leaves change later as you go south. If you'd like to combine some foliage viewing with an urban weekend and maybe take in a show or get tickets for a football game - pick a different city each weekend from Boston down to Washington DC. 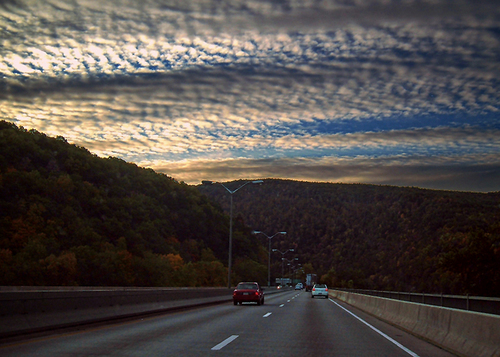 Philadelphia is a good place for your Fall Foliage PA headquarters and a drive up the Potomac is a great way to see the Maryland Fall Foliage 30 minutes out of the Capital. Skyline Drive and the Blue Ridge Mountains lose their crowds and turn yellow, gold and red in the fall and late October is a good time to close out the West Virginia fall foliage season. And for the 3 people a year who search for "Pittsburgh fall foliage" - we have two pointers - Grandview Avenue and Fallingwater. Its a different experience, the Colorado fall colors, the wild-west towns, the snow covered peaks (and sometimes even, the snow) and the mix of evergreens and aspens. Fall Foliage in Colorado can be less than an hour outside of Denver - try Georgetown, or a bit further, Estes Park. Further south, you can even find some decent New Mexico fall foliage spots near Albuquerque, Santa Fe and in the Four Corners region of the state. And what would a back to school season trip be without visiting the shopping malls? For the urban and eco-conscious types who don't own cars and don't want cars and don't want to park cars and don't want to feed cars and don't want to bathe cars - this post is for you (and we bet you live in NY, Boston or SF). ZipCar pioneered the concept of renting a car for a few hours to visit friends on the island or for an interview in the valley or for the fall drive to Concord or for NY Fall Foliage. Walk over to where the car is parked, swipe the card and the car is yours, all gassed up. Drive back and the spot is waiting for you. It turns out that the "gas included" feature really got people excited in the $4 gas age. SO, the big guys have noticed and are going for the same model. 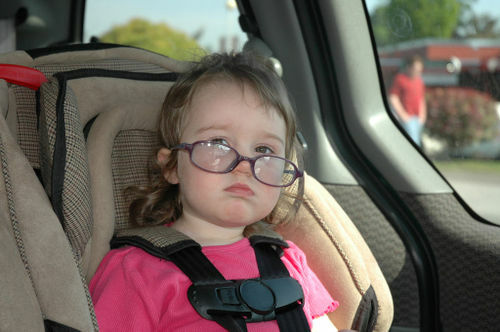 Recently (as described in the Boston Globe and summed up in this blog) U-Haul and Hertz are doing something similar. 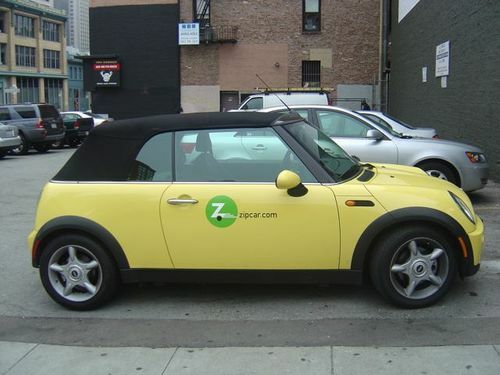 It looks like they are still trying to figure out what ZipCar already did, and ZipCar is more "green" using hybrid cars - but the fact that these guys are in means this is going mainstream. Great news for all of us and for the trees. Denver readers - this weekend begins the peak for Colorado Fall Colors. 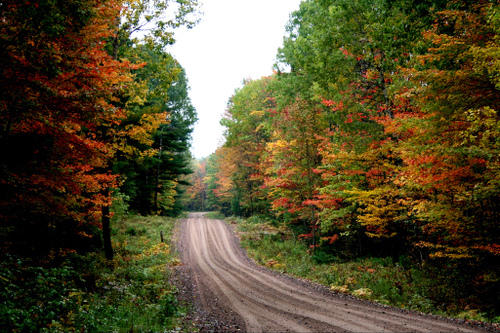 The Aspen Hollow Truck Trail in Lewis County, New York. Grand Canyon National Park - Take U.S. 89 to U.S. 64 to the South Rim from Flagstaff and stay off AZ 64 and U.S. 180. Also, come very early or very late to avoid the lines. If you've got time to spare head to the North Rim where only about 10% of the summer visitors end up. Don't be afraid to use the free shuttles, they can save you a lot of time. Yellowstone National Park - Don't bother if you don't get here before 9 in the morning. Head to places like Fairy Falls, Point Sublime, Yellowstone Lake, and Lone Star Geyser during the heart of the day when the park is full of tourists. 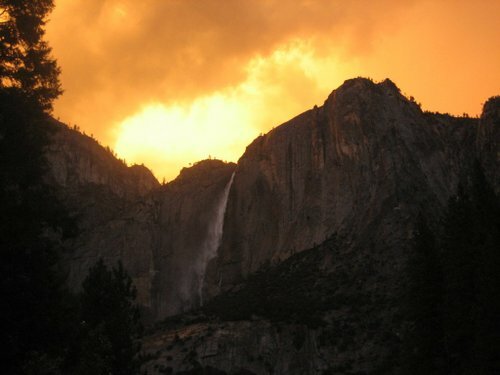 Yosemite National Park - Get up before the crack of dawn in order to beat the crowds into the park and make your way to Yosemite Falls for a spectacular sunrise. This park is usually packed in summer but head toward Hetch Hetchy Valley for some relative peace and beautiful scenery. Zion National Park - Avoid the south entrance all together and take Utah 9 to the east entrance instead. This park also features a shuttle service to keep more cars off the roads. To really avoid the tourists come in the winter time, because between April and October there are an average of 400,000 visitors a month in the park. A 1957 automobile was buried in the courthouse lawn today - with a bottle of tranquilizer pills in the glove compartment. Into the hole with the new Plymouth hardtop went a steel "time capsule'' containing assorted documents and artifacts of Oklahoma's semi-centennial year. 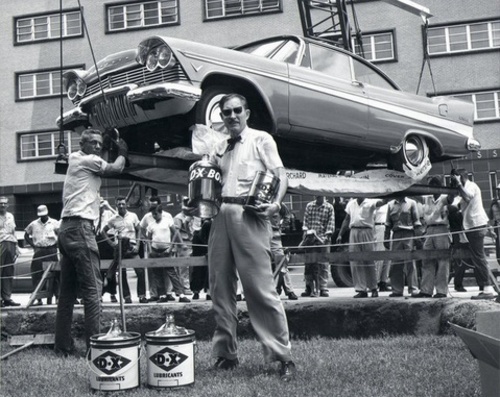 The car, mounted on a steel skid and swathed in a plastic and paper wrapping, was lowered into the concrete-lined well no the southeast corner of the lawn during dedicatory ceremonies marking the observance of Golden Jubilee Week here. "This is the sort of thing that could happen only in Tulsa,'' commented Chairman Lewis Roberts Sr. "We have been amazed - although I guess we shouldn't have been - by the cooperation of every one concerned in making this event possible. The vault will be opened in 2007. The automobile will be awarded then to the person who guessed nearest to the city's population figure at that time. If he or she is not living, the award goes to the heirs, along with the proceeds from a $100 trust fund. Guesses have been microfilmed and are sealed in the steel capsule. Many are worried that the Plymouth may have turned into a rustbox over the intervening years. Below is a video of the time capsule from 1957. Roughly 38 million Americans are trekking more than 50 miles away from home this Memorial day weekend. Despite continually rising gas prices, it's an increase of about 2 percent over last year. A bit surprising given that gas is averaging around $3 and a quarter throughout the country (a 36 cent increase over last month). Hotel rates are also up over 10 percent but it hasn't kept Americans from traveling. An AP-Ispos poll showed that Americans considered the rising gas prices a "serious hardship" but they're cutting back on other things to compensate (food?). Good luck on the roads this weekend. On the road near Lubbock, Texas. 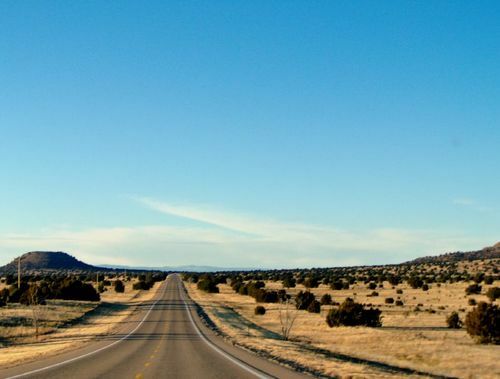 If you want to outdo the Joneses this year, put their trip to the Grand Canyon to shame by hitting all 50 states during your one week vacation. That's what one guy from California did, his motivation: "the best way to prove that I really could 'go somewhere' in a week’s vacation, was to 'go everywhere,' by visiting all 50 states." 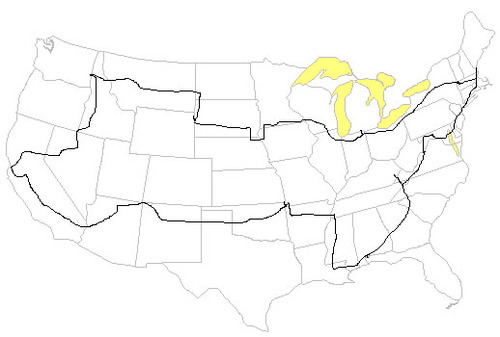 In just nine and a half days on 320 gallons of gas he managed to hit every state. Go to Barry's homepage to see his play by play of the entire trip. We've talked about Salvation Mountain near the Salton Sea before, but now we've come across a great flickr set of user rouseville who went on a road trip through the California Desert and passed by the major attractions near the Salton Sea: "Desert Shores, North Shore, Bombay Beach, Niland, Salvation Mountain, Slab City and the Cabazon Christosauruses." The flickr set consists of just under 100 pictures and they're accompanied by great notes for each picture. If you're in LA, here's a great place to get a way for the weekend. 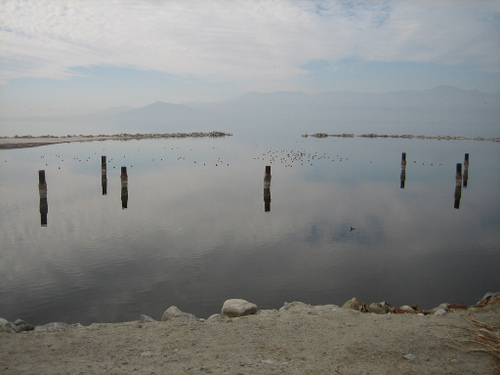 The picture above is from the North Shore: "This is what the docks look like...throughout the coastline, the Salton Sea looks like it's an infinity pool - the omnipresent desert haze & good distance to the far shoreline contribute to a vanishing horizon effect." Sometimes referred to as “America’s Switzerland,” this part of the state of Washington is in the area of North America known as the Pacific Northwest. Home to high mountains and evergreen forests, northwest Washington and the Cascades are bordered by the Canadian province of British Columbia to the north and, to the west, the Pacific Ocean. The Cascade Mountains run right through the middle of the state of Washington, with Mt. St. Helens standing proudly at the southernmost point in the region. Many areas in the region are great for scenic drives, hiking and biking, where the lush, green mountainous scenery can be appreciated either from up close or from afar.